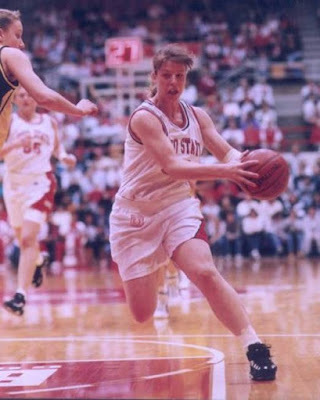 One of the greatest players in Ohio State women’s basketball history, Katie Smith was selected as one of 10 finalists for the 2018 Women’s Basketball Hall of Fame. The three-time Olympic gold medalist set the record for points scored by either a man or woman in the Big Ten during her four-season collegiate career from 1992 to 1996. Smith was honored as the Big Ten Player of the Year her senior year. In her freshman season, she powered her team to a conference title and NCAA championship appearance. Smith played 15 season in the WNBA and two professionally for the Columbus Quest from 1996 to 1997. When she retired in 2013, she was the all-time women’s professional basketball leading scorer with 7,885 points. Smith was voted one of the 20 best and most-influential players in WNBA history in 2016. After her playing career ended, she was hired as an assistant coach by the New York Liberty. She became the team’s head coach Oct. 16. Smith was inducted into Ohio State’s Athletics Hall of Fame in 2001. McGuff said she frequently makes trips to Columbus continues to stay in touch with the program. The 2018 Basketball Hall of Fame finalists were announced were Jan. 11. Inductees will be announced the night of Feb. 12 during the Louisville-Connecticut game. The class of 2018 will be introduced during the Final Four in Columbus, meaning Smith might have a homecoming if inducted.